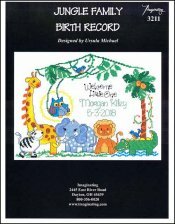 Jungle Family Birth Record [D5944] - $6.00 : Yarn Tree, Your wholesale source for cross stitch supplies. Cross stitch chart from Imaginating. Designed by Ursula Michael. Giraffes, elephants, zebras, alligators & lions....oh my! It's about that time for a little one to arrive. Stitch the design for a family who is welcoming a new little one into the family. You can personalize this design with the baby's name & birth date. Welcome to the jungle! Stitch count is 162v x 116h. Stitched on #2936 Zweigart Aida 14ct White 59" wide or #8221 Zweigart Aida 14ct White 43" wide. Ivory Zweigart Hardanger 36"x 43"